Compiled and edited by Fr. Luke Veronis – 271 pgs. Lynette Katherine Hoppe’s life and death touched hundreds, if not thousands of lives as she served as a missionary in Albania, tragically succumbing to cancer in 2006. In Lynette’s Hope: The Witness of Lynette Katherine Hoppe’s Life and Death, close family friend and fellow OCMC missionary Fr. Luke Veronis retells the story of her life, and then lets her writing speak for itself. In poignant, honest prose, Lynette’s diaries, newsletters and website chronicled her struggles in the “valley of the shadow” as she faced impending death. In the midst of such heartache — a young missionary wife and mother ill and dying — how did she live? How did she die? 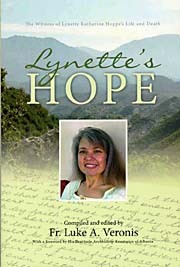 The answers to those questions will move readers to agree with those who witnessed her passing, that truly hers was a “beautiful death.” No one who reads Lynette’s Hope will come away untouched; all will be stirred to a new resolve to live life as she did, in the presence of God, with joy and faith.